Iâm Teresa Morrow, Founder of Key Business Partners, LLC and I work with authors and writers by managing their online promotion. As part of my job I read a lot of books (and I love to read anyway! ).Â I am here to offer a weekly post about one book I am working with and one book I have put on my reading list. The books will cover topics such as social media (Facebook and Twitter), organization, career building, networking, writing and self development and inspiration. 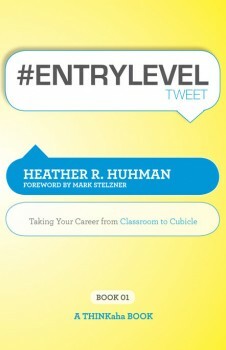 This week I would like to start off with a book I have read and working with entitled #EntryLevel Tweet by Heather Huhman. ~You need to choose a career that makes you happy and excited about going to work, but remember that not every day on the job will be fun. —>there is some part, it may only be 1% of your job, that you will not like doing as part of your job. Also, she adds, Donât beat yourself up for not making the right choice at first–most of us donât! —>How true this is! I was going to be a marine biologist, until I went to college and found out I was not as good as math and science as I thought I once was in this subjects. Huhman then goes on to discuss how the world for those seeking their first job out of college has changed. “Even in a candidate saturated market, there are many more (and better) ways to get in front of hiring managers than there used to be. —>Oh, yes, this is certainly true. There are people who can do a video resume for you. *Actually that is how my niece landed her first job as a reporter. She continues to help recent grads by providing them stepping stones to secure the proper tools to obtain in order to be more successful at landing the job. Heather R. Huhman is a career expert and Founder of Come Recommended, an exclusive online community connecting the best internship and entry-level job candidates with the best employers. As an experienced hiring manager and someone who has been in nearly every employment-related situation imaginable, Heather knows and understands the needs of todayâs employers and internship and entry-level job seekers. Her expertise in this area led to her selection as Examiner.comâs entry-level careers columnist in mid-2008. The daily, national column educates high school students through recent college graduates about how to find, land, and succeed at internships and entry-level jobs. You can pick up your copy of #EntryLevel Tweet here. Now it is time for me to share with you a book I have not read but it is on my reading list. My choice for this week is Blue Ocean Strategy by W. Chan Kim and Renee Mauborgne and published by Harvard Business School Press. Blue Ocean Strategy provides a systematic approach to making the competition irrelevant. In this frame-changing book, Kim and Mauborgne present a proven analytical framework and the tools for successfully creating and capturing blue oceans. Examining a wide range of strategic moves across a host of industries, Blue Ocean Strategy highlights the six principles that every company can use to successfully formulate and execute blue ocean strategies. The six principles show how to reconstruct market boundaries, focus on the big picture, reach beyond existing demand, get the strategic sequence right, overcome organizational hurdles, and build execution into strategy. W. Chan Kim is Co-Director of the INSEAD Blue Ocean Strategy Institute and The Boston Consulting Group Bruce D. Henderson Chair Professor of Strategy and International Management at INSEAD, France. Renee Mauborgne is The INSEAD Distinguished Fellow and a professor of strategy at INSEAD. She is also Co-Director of the INSEAD Blue Ocean Strategy Institute. You can purchase your copy on Amazon. Thanks Claus! I am looking forward to reading it. What is one thing you got from the book? Blue Ocean Strategy Which one you discuss an outline of what is contained therein. Makes me think the strategies contained in it is the ideas are brilliant. What makes me interested is that they discuss how the reconstruction of market boundaries. If I read this that thing I want to know….